First, it was WannaCry. To be fair, I had my own doubts about BitCoins and other cryptocurrencies even before the havoc. In spite of all their benefits, those currencies seemed anarchical to me because of the distributed design and the absence of any regulator. 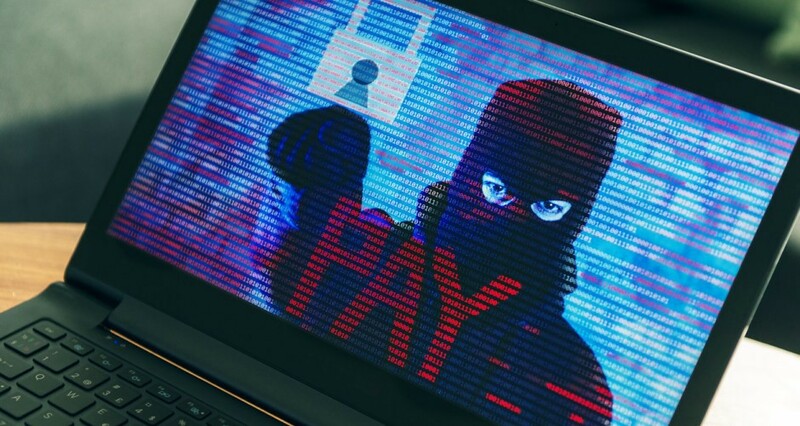 It is quite well known that these currencies are widely used to launder money, buy and sell drugs, and do all sorts of illegal transactions because it’s simply impossible track the user’s information hidden behind the layers of encryption. And then WannaCry comes, encrypts files on your computers, and asks you to pay in BitCoins to restore them. Talk about a safer world! 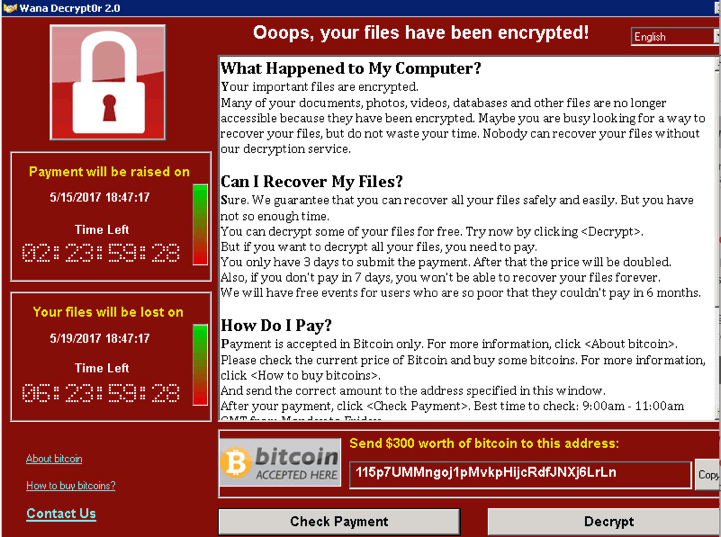 Enough has been written about WannaCry so I won’t delve into it here but you may find this CNET article useful. Cryptocurrencies are not yet mainstream and they may never be if such instances make us question their real purpose. However, I’m more worried about the way something that’s already mainstream works and it’s scary! I am afraid that FaceBook has become too powerful and unempathetic towards its small customers. Since last two days, I am trying to put Facebook Promos for my passion project, www.remoteexplorers.com. 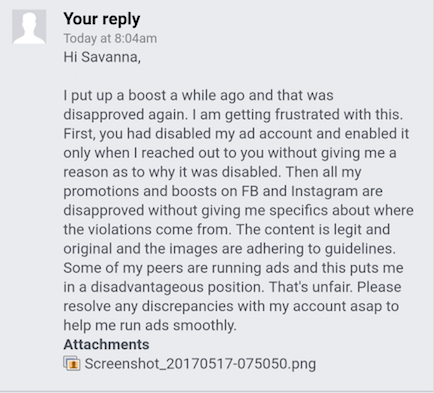 All those promos have been disapproved by Facebook stating policy violation without giving any specifics. I am a risk manager, an admin of 40k strong community on Facebook, and I do content quality check for a Website that generates millions of pageviews a month. There is no way I can let any content get published that doesn’t fit into the policy. However, just to make sure, I have rechecked the content several times and haven’t found any violation. 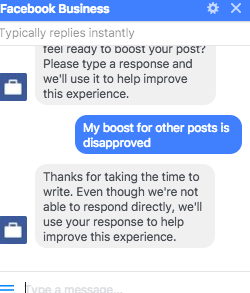 I’m not as worried about my promos being disapproved as I am with regards to Facebook’s attitude towards its small customers like me. These are clearly not the words that any customer-centric company will use. Notice that they have not tried to explain why my promos were blocked and what was the reason for violation. Lack of transparency, isn’t it? Like it or not, Facebook is probably the most preferred platform for ads related to lifestyle products with over a billion people out there. Most of us use Facebook almost every day and I won’t deny that it helps me stay connected with my friends, find help from communities, and much more. However, be on the other side and it is acting like a dictator. To make it a truly great company and to justify its valuations, Facebook should start listening to their customers first. How will they? They don’t even have a support phone number listed for their customers! Instead of having a phone number listed, they have this chatbot which must often be irritating already irate customers exponentially. 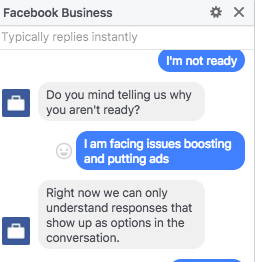 In a way, WannaCry and FaceBook’s attitude towards customers are similar. 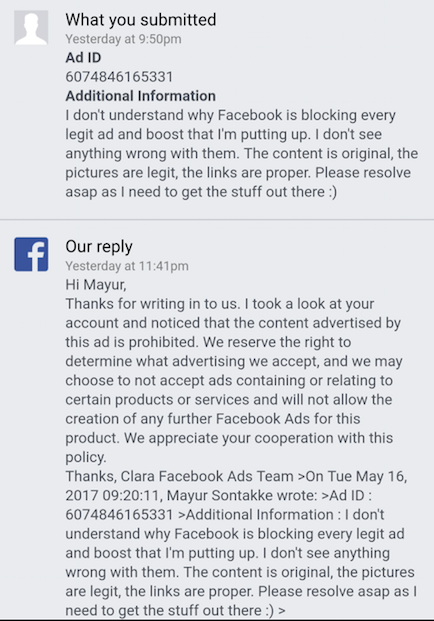 WannaCry Publishers want to extract money from you and are clear about it while Facebook has prohibited me from getting something that I deserve and am ready to pay for.